ग्ली वॉलपेपर. Couldn't find one I liked, so I sliced promos and made my own. Sized for widescreen monitors.. HD Wallpaper and background images in the ग्ली club tagged: glee image wallpaper widescreen cast promotional. This ग्ली wallpaper might contain मोबाइल फोनों के लिए, हास्य पुस्तक, मंगा, कार्टून, एनीमे, कॉमिक बुक, and manga. THANKYOU!!! have been trying to find one like this for AGES!!! This is now my computer background. 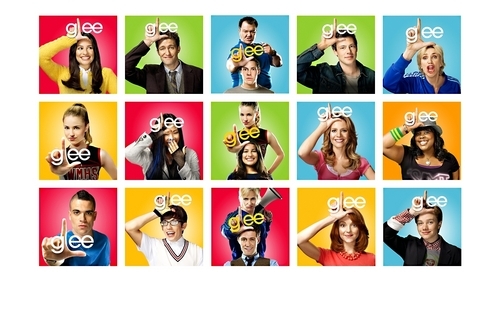 Does anyone have the link to take/photoshop yourself w/the Glee logo? hahahahaha.. i never seen any whole episode of glee. but i like them already.. i like musical tv series or even in a movie like moulin rouge person that's why. COOL WALLPAPER IT IS, ISN'T IT? I LIKE THEIR POKER FACE VERSION. i luv it! puck is soooooo hot!! Will's face is so weird. And I still don't get why the promo shots have the Cheerio outfits as black instead of white. DId they really think black was going to work out? wow this is a pretty old wallpaper now! But still great! they are Amazing!!! I love them!!!!!!!! For a Fantastic Friend YOU !